During the early years, African violets were predominantly a greenhouse plant, rather than a houseplant. From 1893 until 1930, various writings in horticultural and botanical publications indicate that African violets were mainly grown under glass structures. A favorite place to exhibit these plants was near the edge of staging in public and private greenhouses and at flower shows. The failure to grow in homes appears to be due in part to the type of heating system used at that time, as most homes did not have central heating. This allowed temperatures in the homes to fluctuate greatly. In most cases, homes were too cold during the winter for the successful growth of African violets. The plants soon developed a reputation for being difficult and finicky. A New York florist, George Stump first brought African violets to the United States in 1893 or 1894. Philadelphia florist William Harris bought two plants from Stump in 1894. Possible descendants of these plants were seen by Roger Peterson in Philadelphia in 1910. Peterson purchased 100 plants and brought them to Cincinnati, Ohio where he continued their production and hybridization. The Peterson Greenhouses eventually became an important early commercial grower of African violets and was one of the first to grow plants of the African violet species. No history of the African violet would be complete without a discussion of the “Ten Original Crosses” or the “Original Ten”. These plants were the first truly successful commercial cultivars and were developed by the firm of Armacost & Royston. One story suggests that Walter Armacost became interested in African violets after seeing the plants in the greenhouse of a friend. He obtained three leaves from the plants and experimented with propagating them. Intrigued by the plant’s potential, the firm ordered seeds from Benary’s of Germany and Sutton’s of England in 1927. Approximately 1,000 plants were grown to blooming size. After several years of selection, ten outstanding plants were chosen and named. They were introduced to the public in 1936 as: ‘Admiral’, ‘Amethyst’, ‘Blue Boy’, ‘Commodore’, ‘Mermaid’, ‘Neptune’, ‘No. 32′, ‘Norseman’, ‘Sailor Boy’, and ‘Viking’. All of these cultivars had blue to purple flowers and varied slightly in growth form and leaf characteristics. These cultivars are still grown in plant collections today. Four of the “Original Ten” hybrids: Clockwise from top left, ‘Blue Boy’, ‘Neptune’, ‘Amethyst’ and ‘Admiral’. After several years of propagating violets and shipping them wholesale all over the world, Armacost & Royston discontinued this part of their business because the plants were going to growers who did not understand the needs of African violets and consequently found their performance disappointing. Fortunately, increases in knowledge about the plants, improvements in home heating systems, and the development of many new colors and plant types rescued the African violet from obscurity and elevated it to today’s popularity. In 1945 there appeared in a national magazine, The Ladies Home Journal, an article on the care and culture of African violets. It also featured a full-page color picture of some of the popular cultivars. This article by Helen Van Pelt Wilson was a turning point in the growth of African violets because it showed how attractive the plants could be and gave information on how to grow them successfully. Enough interest was shown that the author later published the article in pamphlet form, making the information readily available to the public. Information about growing African violets was also available through “Round Robin” groups. The Flower Grower Magazine, a popular garden publication of the time had 37 Round Robin groups pertaining to the culture of African violets. The estimated 350 individuals of the “Robins” corresponded with each other exchanging ideas, cultural information, and experiences. These individuals formed the nucleus for an explosion of interest in African violets. In 1946, The Flower Grower Magazine had an announcement by the H.G. Hastings Co. of Atlanta, Georgia that they would sponsor an African violet show on November 8th and 9th. More than 200 exhibitors from 11 states showed plants of 31 cultivars. An estimated 8,000-10,000 people viewed the show over the two days. Visitors came from 103 cities and towns in 14 states. A result of this enormous interest in African violets was that a society, The African Violet Society of America, Inc. (AVSA) was founded on November 8th, 1946. The AVSA was incorporated on June 30, 1947 with 250 charter members. The first annual convention and show was held in Atlanta on October 9 and 10, 1947. Seventy-seven exhibitors from 20 states showed 286 plants of 62 cultivars. Today, the AVSA is an international society with over 12,000 members in 48 countries. The purpose of the society is to provide a center through which African violet enthusiasts can obtain and exchange growing information. 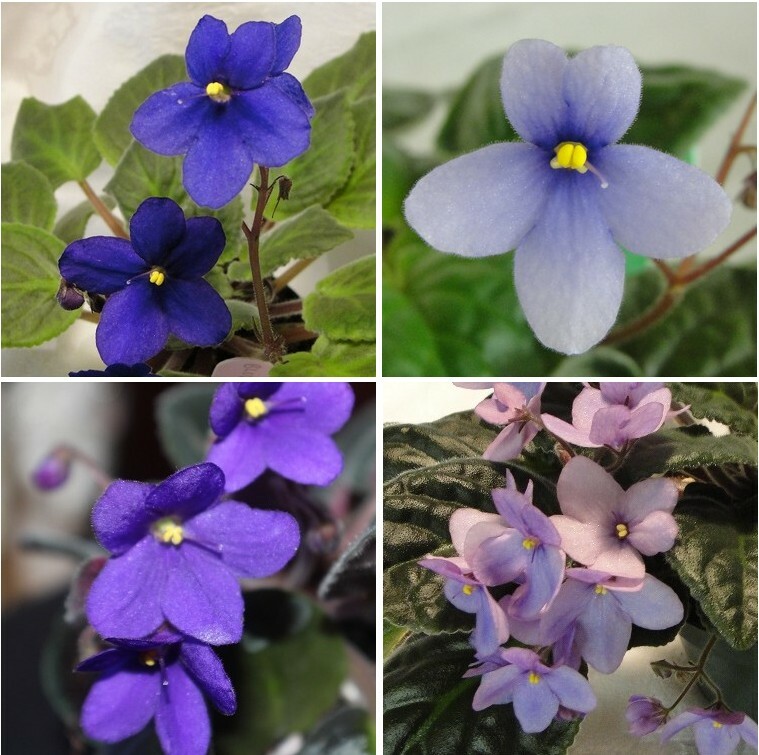 The AVSA is also the International Registration Authority for cultivated hybrids of African violets and offers a Master Variety List of all recorded species and cultivars. Its publication, The African Violet Magazine offers interesting articles on how to grow African violets, where to purchase them, and continuous information on the latest developments in the African violet world. The AVSA continues to hold annual meetings and plant shows that feature African violets and other members of the Gesneriaceae.